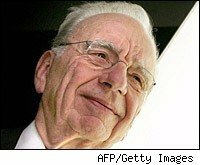 Rupert Murdoch says he won't sell MySpace, doesn't want to buy Twitter and is still bearish about the economy. Not one to shy away from a microphone, Murdoch spoke to media outlets during the Allen & Co.'s Sun Valley media conference in Sun Valley, Idaho. The event attracts current technology celebrities such as Twitter CEO Evan Williams, Google (GOOG) CEO Eric Schmidt and even non-tech celebs, such as NBA superstar LeBron James. While the New York Post said James went to learn how to expand his marketing company, Murdoch may be thinking of continuing to contract his social-networking site MySpace, which had two rounds of layoffs in June. "I'm shocked at the business mood, which is either that we're at the bottom or going lower, but that it's going to take years and years, like five years at least, before we see any real growth coming out of this," Murdoch said in an interview with Fox Business Network at the conference. "Bearish, very bearish," was his assessment of the mood at the conference. Staying with the bearish theme, Murdoch told Reuters that a company looking to buy micro-blogging Web site Twitter, should "be careful." Makes sense that he would say that considering how his $580 million purchase of MySpace in 2005 has fared. Google CEO Eric Schmidt described the mood at the Idaho conference as "somber," Reuters reported, saying speakers at the conference spoke of a flat economic recovery. He said that while the "worst is behind us, speaking generally, not specifically to Google," he's not seeing strong signs of a fast recovery.